The US non-farm payrolls report was released today and was much as expected. Job gains were strong, unemployment is low and wages continue to rise. While several points within the report were tepid compared to expectation there is one that will move the dollar; average hourly earnings. Average hourly earnings rose by 2.9% in the past month and show no signs of abating. The NFP shows an increase of 204,000 jobs that, with revisions to the previous month, has resulted in average gains of 185,000 over the past twelve months. Based on other data points from the labor market this trend is going to continue at least into the end of this year. The labor market is tight, there are far more jobs than workers, and that means one thing; upward pressure in wages and that is what we are seeing. Regarding forward outlook, the Index of Leading Indicators has been positive for more than two years and came in above expectation at the last read. This, along with increases in both the manufacturing and services sector PMIs, points to accelerating growth in the second half of this year. Accelerating growth is a situation that will add upward pressure to wages as employers do whatever it takes to attract and retain employees. The key takeaway is that wage inflation is running near 3.0% and well above the Fed’s target rate. While not the only input regarding core US inflation it is a very important part of the picture. Core inflation has been on the rise this year and will soon cross the 2.0% level. If the FOMC wants to curb inflation they will have to act to control economic growth and that means rate hikes, more rate hikes than what the market had been expecting. The EUR/USD fell hard on the news, shedding more than 50 pips in a matter of minutes to create a long red candle on the daily charts. 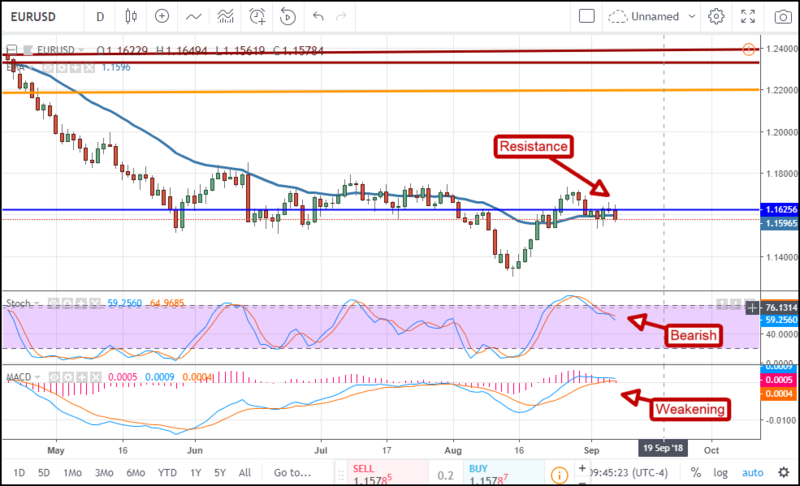 The move has confirmed resistance at the 1.1625 level and may take the pair down to support targets near 1.1525 and 1.1400. Next week there are a number of US data points including the PPI, CPI and FOMC Beige Book that could add downward pressure to this trade.